The diverse range of papers and posters presented at the COMSOL Conference 2016 Munich covered application areas such as the flow properties of shark skin, processes during cake baking, and the optimization of automotive loudspeaker systems, to name just a few. Altogether, over 150 high-quality simulation projects were presented at the event. Three papers were awarded Best Paper awards by the conference program committee and for the three Best Poster awards, over 300 conference attendees voted for their favorites. The winners were recognized during the awards ceremony at the conference gala dinner. 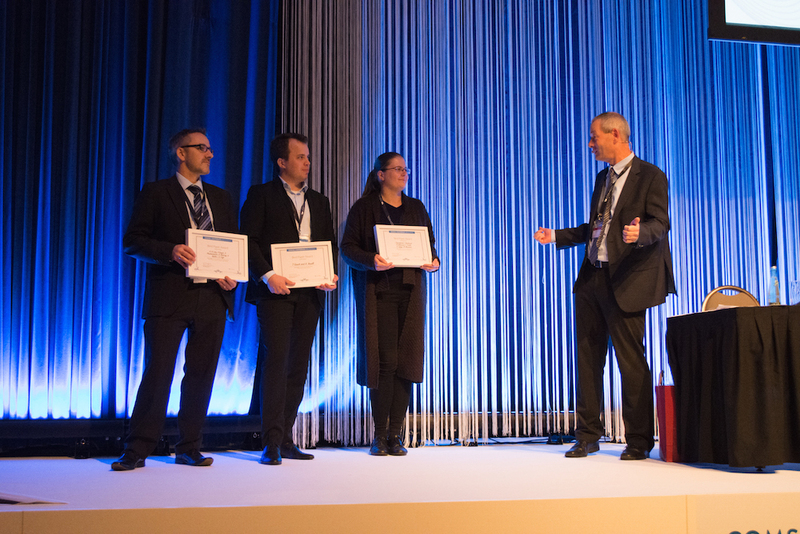 The awards ceremony at the COMSOL Conference 2016 Munich. The conference program committee for the COMSOL Conference 2016 Munich consisted of 27 leading academic and industrial simulation experts who were tasked with reviewing the conference abstracts and choosing the top three conference papers. 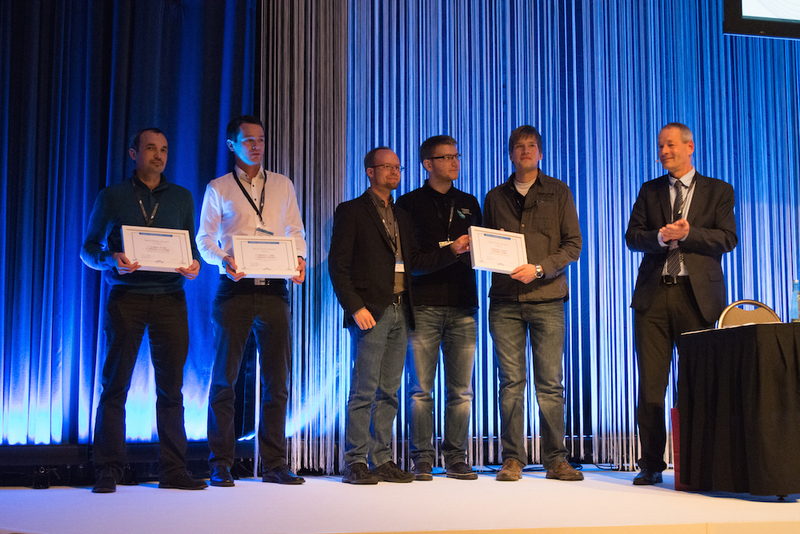 The COMSOL Conference 2016 Munich Best Paper award winners. From left to right: Karl-Heinz Leitz; Tobias Gasch; Iryna Tomashchuk; and Bernhard Fluche, managing director of Comsol Multiphysics GmbH. The first Best Paper award was given to Tobias Gasch from KTH Royal Institute of Technology in Stockholm, Sweden for the paper “Cracking in Quasi-Brittle Materials Using Isotropic Damage Mechanics“. 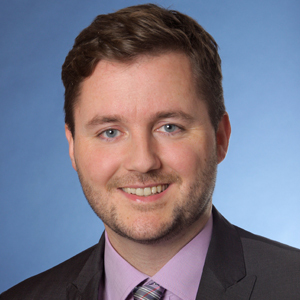 Together with his colleague Anders Ansell, Gasch created an extension of the Solid Mechanics interface in COMSOL Multiphysics to analyze localized deformations of quasibrittle materials, which occur in cracking concrete, for example. The research team used the Physics Builder to create a custom user interface and validated the implemented model using two literature examples of plain and reinforced concrete. The models show good agreement with experimental results. Karl-Heinz Leitz and his colleagues from Plansee SE in Reutte, Austria also won a Best Paper award for their paper titled “Thermo-Fluiddynamical Modelling of Laser Beam-Matter Interaction in Selective Laser Melting“. In their research, they describe the development of a thermofluiddynamical simulation for laser beam-matter interaction. This comprehensive multiphysics model includes laser radiation absorption; conductive and convective heat transfer; as well as melting, solidification, evaporation, and condensation. The model is used to compute the process dynamics of selective laser melting (SLM), but the researchers emphasize that it could easily be adopted for the simulation of other laser-based manufacturing processes. The final Best Paper award went to Iryna Tomashchuk and her colleagues at the Laboratoir Interdisciplinaire Carnot de Bourgogne in France for the paper “Multiphysical modelling of keyhole formation during dissimilar laser welding“. In their paper, the researchers describe the implementation of a time-dependent multiphysics simulation of the pulsed and continuous laser welding of dissimilar metals, based on the moving mesh approach. The simulation results for the pulsed welding model were validated for a Ti6A14V alloy and Ti6A14V steel coupled material by comparing them to experimental well dimensions. The research team plans to test more dissimilar material couples in order to further understand keyhole formation. 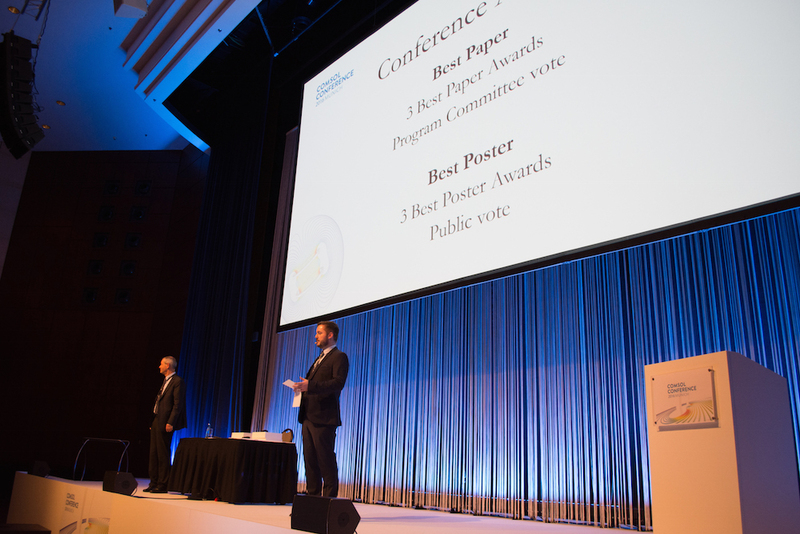 All of the attendees at the COMSOL Conference 2016 Munich had the chance to vote for three Best Poster awards, which were presented at the event in addition to the Best Paper awards. COMSOL Conference 2016 Munich Best Poster award winners. From left to right: Pascal Le Bideau, Christoph Hollenbeck, Kersten Kröger, Andrej Genschel, and Simon Bekemeier, with Bernhard Fluche. The first Best Poster award went to Pascal Le Bideau from Université de Bretagne Sud in Lorient, France for a culinary engineering presentation. The poster “Numerical Model for Predicting Heat and Mass Transfer Phenomena during Cake Baking” gives an overview of a cake baking simulation study performed by Le Bideau and his colleagues. The aim of the research is to provide a numerical model for predicting heat and mass transfer phenomena as well as the swelling encountered during the baking of cake contained in a mold. The medium is assumed to be a deformable porous medium containing three phases (solid dough, liquid water, and gaseous water and CO2). Christoph Hollenbeck received a Best Poster award on behalf of his research group from Imagine Engineering GmbH in Bergheim, Germany. The poster, titled “Simulation of the thermal expansion of an inductively heated gear wheel for shrink fitting purposes“, describes the simulation approach for a 3D coupled magnetic, thermal, and mechanical model. The aim of the study is to identify suitable parameters for the coil current and the frequency of the alternating field in order to attach (and detach) a gear wheel on a shaft. The simulation results of the mechanical stresses enabled the researchers to evaluate whether process control concerning rapid heating is mechanically possible. They found that increasing the coil current could significantly reduce the process time for induction heating. This is because the tested type of steel has a yield strength five times higher than the maximum arising equivalent stresses. The final Best Poster award was given to Simon Bekemeier and his colleagues from the University of Applied Sciences in Bielefeld, Germany for the poster “Beverage Refrigeration Simulation in Dependence on Container Shape, Material and Orientation“. This poster may have been so popular because the conference location in Bavaria pairs perfectly with the poster topic: beer. We would like to thank everyone who presented their work at the COMSOL Conference 2016 Munich and congratulate the six Best Paper and Best Poster award winners. It was a great experience learning about all of your interesting research topics. The projects highlighted in this blog post are just the beginning. Stay tuned to access all of the posters and presentations from the COMSOL Conference 2016 Munich.